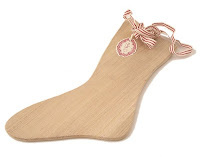 Cottontails Baby: Free Maileg wooden decoration! In a shameless attempt to gain some more links to Cottontails (that's my website, NOT this blog) I am giving away some lovely wooden Christmas stockings. It's simple - please just link to Cottontails (details below), then email me your address and I will send you a Maileg wooden stocking. I have quite a few left so unless I am inundated (which would be nice!) I shouldn't run out, but if I do I'll find something else nice. The stockings are quite large (40cm) and a kind of Scandinavian shaker style. They're gorgeous. And must mention the words Moulin Roty in the link. And don't forget to email me your address. Those are wonderful and would be so fun to spruce ip :) You are so sweet!! I alrady have a link to you in my favourite websites but I will check it is the right one! Hope all is going well with the mailings and you are nice and busy? I have been bonkers with too much to do and stressing out but I am trying to do better this week! Hi Charlotte,no problem to add a link to such a gorgeous website. Hope it works really well for you. Hi Charlotte, I have added the link on both my Blogs hope it helps get you lots of lovely new browsers and customers.